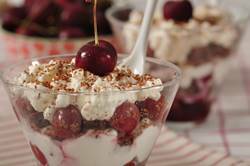 These individual Black Forest Trifles are a modern twist on the Black Forest Cake. They use the same components; chocolate, cherries, and whipped cream, yet in a slightly different form. That is, instead of cake, I've used chocolate brownies. The brownies are cut into small chunks and are layered with Morello cherries and whipped cream. So easy and sooo good. We start by making chocolate brownies. This brownie is made with unsweetened chocolate which is chocolate that doesn't contain any sugar. This produces a brownie with a deep chocolate flavor. The brownies will become wonderfully dense and fudgy when you refrigerate the trifles. For the cherries I like to use sour cherries. My favorite being the bottled Morello Cherries that are packed in a light syrup. If you cannot find them, you can also use the canned sour cherries packed in syrup or water. If using cherries that are packed in water you may need to add a little more sugar than what is called for in the recipe. I like to flavor the Morello Cherries with either Kirsch or a Cherry Brandy. For those who do not want to add alcohol, you could add a couple of drops of almond extract. Brownies: Preheat your oven to 325 degrees F (165 degrees C). Butter, or spray with a non stick vegetable spray, an 8 inch (20 cm) square baking pan. Then line the bottom of the pan with parchment paper. Melt the chocolate and butter in a stainless steel (heatproof) bowl, placed over a saucepan of simmering water. Remove from heat and whisk in the sugar. Next, whisk in the vanilla extract. Whisk in the eggs, one at a time. Finally, stir in the flour and salt. Pour into the prepared pan and bake for about 25 minutes, or until a toothpick inserted in the center comes out with a few moist crumbs. Remove from oven and let cool completely on a wire rack before cutting into squares. Cherries: To make a sauce, drain the cherries, reserving the liquid. Place the liquid in a small saucepan, along with the sugar, and simmer for about 10 minutes or until the sauce is syrupy. Remove from heat and add the Kirsch. Pour the sauce over the drained cherries and let cool before making the trifles. Whipped Cream: In the bowl of your electric stand mixer, fitted with the whisk attachment (or with a hand mixer), whip the cream, sugar, and vanilla extract until soft peaks form. To Assemble the Trifles: You will need eight small glasses or bowls. For each trifle, take one brownie and cut it into small bite-sized pieces. Place in the bottom of your glass or bowl. Next, place a spoonful of the cherries, and their juices, on top of the brownies. Finally, top with a large dollop of whipped cream. You can repeat the layers, starting with the brownies, if you like. Cover and refrigerate for 4 to 24 hours to allow the flavors to mingle. Just before serving sprinkle the top of each trifle with grated or shaved chocolate.